When I first began reading The Story Hour, I am a little stunned. It opens with those words above and continues in this broken English for as long as we stay in Lakshimi’s narrative. At first I think, I cannot keep reading this. The former sub-editor in me keeps wanting to correct the language! But Lakshimi grows on me, and as her life story is revealed, my issues with her language fade into the background. And then there is the fact that this is a book written by Thrity Umrigar, whose The Space Between Us I adored. And whose books I am happy to devour. Lakshimi is a recent immigrant from India. Isolated, cut off from her family, she is sad and lonely and friendless. She has no one except her husband and he doesn’t even treat her like a person (his pet name for her is “stupid”). When a customer of their restaurant, the only one who bothered to know her name, to ask her how she is, tells her he is leaving for California, Lakshimi breaks down and tries to kill herself. Moved by her situation and identifying with Lakshimi as they both lost their mothers at a young age, Maggie begins to treat Lakshimi at her home office for free and despite her reservations, despite the protocols of Maggie’s profession, they become friends. Of course it’s not all happy-go-lucky, for they have conflicting expectations of their relationship. And when Maggie learns of Lakshimi’s long buried secret, it shakes their bond, and forces decisions that will change their lives. The switch between narratives can be jarring. Lakshimi’s broken English reflects not just what she says but also her thoughts. That puzzles me at first as I wonder why the voice in her head would sound that way. But I guess Umrigar wants to keep it constant, so that we reflect on the contrast between the lives of these two women. And it is vast. It’s not just a cultural and class divide. Maggie reveals everything to us. We feel her fears and worries, stress and unhappiness. We hear her joy and laughter, which sadly is a lot less often. Lakshimi, on the other hand, hides her history and holds tight to her secrets and her story is only gradually revealed to the reader, despite the first person narrative. As a result, we are as shocked as Maggie by her revelations. It’s effective and affecting. Umrigar’s characters get under the reader’s skin, so real and involved are you in their lives, whether they are likeable or not, that you feel for them. 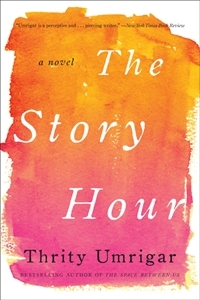 The Story Hour is a reflection on the little things, on the stories that are told, the relationships between husbands and wives and friends, and their willingness to forgive. The broken English did take a bit of getting used to, but I loved this book. Ms. Umrigar is a fantastic author. Thanks for sharing your thoughts. My review will be up on September 12. She is such a good writer! That broken English certainly serves to highlight Laskshmi’s isolation. It works for me. I share your admiration for Umrigar and this book. I was deeply touched by this book and some of its underlying themes like when and if forgiveness is possible. It was quite a moving book and in some ways a bit different from the other one I’ve read. I am definitely going to read all of Umrigar’s books!